The revelation that the Department of Justice acquired and read the phone records of Associated Press editors and reporters does not change the obvious fact that the mainstream media have been reliable supporters of the Democratic Party, even if they are unappreciated by the administration. This unsavory relationship between the media and the Democrats has long existed, but the political career of Barack Obama marks a quantum leap beyond the media’s traditional liberal preferences and biases––which in the past had at least a patina of objectivity and neutrality––to blatant advocacy, double standards, and explicit partisan hatred. The roots of media bias go back to the nineteenth century, and complaints about bias in part reflect a questionable idea about the media’s role and purpose: that newspapers and other dispensers of public information exist to transmit objective, factual information gleaned and communicated by credentialed professionals. In fact, the notion that reporters should possess Olympian objectivity is relatively recent. In the nineteenth century, most newspapers were explicitly linked to a particular political party and the economic interests of the publisher. In California during the Gold Rush, for example, the San Francisco Alta California was the enemy of Democratic governor John Bigler, whose press champion was the Stockton Republican. Most of the coverage of crime during this period––particularly the spree of the Mexican bandit Joaquín Murieta and the state-funded posse that tracked him down and killed him––reflected those political interests and loyalties rather than mere facts. Moreover, the stories were written in a florid, dramatic style more suitable for a dime novel than a presumably more sober newspaper. Of course protestations of objectivity and accuracy were made, but these were understood to be mere rhetorical camouflage for the editorial opinions sown throughout most news stories. The tradition of lurid sensationalism, scandal-mongering, and exaggeration put in service to profits and a political agenda continued in the “yellow journalism” famously on display in the circulation war between the Hearst and Pulitzer newspapers in the late nineteenth century. More significantly, that was also when the progressive movement promoted the notion that the proper function of the media was to instruct and shape the opinions of voters too uninformed and irrational to be trusted with making the right choice based on facts alone. As historian Chilton Williamson writes of this period, “The presentation of facts simply as facts, editors and writers reasoned, cannot accomplish the exalted goal of saving civilization. To do that, facts needed to be presented according to those rhetorical patterns of thought we call opinions, patterns pointed in some particular direction of convincing an imagined jury.” This “jury” included the opinion-makers, politicians, and citizens who needed guiding by their betters in order to understand and choose the policies necessary for improving society. This rampant partisanship that characterized newspapers for most of their existence may strike us as deplorable, but it functioned much in the same way that James Madison in Federalist 10 wanted political institutions to work. Just as in government, partisan media factions would balance and limit opposing factions, thus protecting the freedom of the citizenry as a whole by limiting the scope of any one faction’s power and influence. With numerous newspapers representing a variety of opinions available, any particular citizen had access to those papers that represented his point of view or challenged the assertions of other ones. By the Sixties, however, several developments compromised this balance and made the press’s partisanship more dangerous. First, journalism became a “profession” certified by a university degree. Before then, as films like The Front Page and It Happened One Night show, journalism was a working-class trade. As late as the 1970s, when my wife began her career as a reporter, most of the veterans in the newsroom lacked college degrees. They had worked their way up from being a copy-kid or a writer of obituaries, earning by experience the job of reporter. Any biases tended to reflect those of class as much as of political ideology. Once reporters started coming out of colleges and universities, however, they were shaped by the leftist perspective of those institutions. These perspectives, once marginal in American public discourse, became increasingly prominent in the press and television news shows. Now the old progressive view that the press should not just report facts, but mold public opinion to achieve certain political ends, served an ideology fundamentally adverse to the free-market, liberal-democratic foundations of the American Republic. As Orville Schell, one-time Dean of the UC Berkeley Graduate School of Journalism, has put it, “In a democracy, indeed in any intelligent society, the media and politicians have to lead. The media should be introducing us to new things, interesting things, things we don’t already know about; helping us change our minds or make up our minds, not just pandering to lowest-denominator wisdom.” Of course, these goals ignore the fact that politicians are accountable to voters, whereas unelected journalists are accountable to no one other than their bosses and the bottom line. And who decides what the minds of voters should be changed to? Isn’t that the function of the editorial pages? The catalyst for this process of the media’s mainstreaming of leftist ideology was the war in Vietnam. The left viewed this conflict not as a Cold War duel necessary for containing communist aggression, as many Americans believed, but as a neo-imperialist attempt to prop up an oppressive regime of capitalist lackeys trying to crush a nationalist liberation movement. As such, it was the duty of the media to instruct their fellow citizens on their errors of thinking and liberate them from their delusions. Similarly, the media attention given to the New York Times’ publication of the Pentagon Papers in 1971 reinforced the narrative of American crimes and bungling in Vietnam, even though the Department of Defense study ended in 1967, and so had nothing to say about the success of General Creighton Abrams in turning the war around after Tet and compelling the North to negotiate for peace in 1973. More recently, we have seen these same accusations of duplicity and incompetence in much of the coverage of the wars in Afghanistan and Iraq during the Bush presidency. Failures, mistakes, collateral damage, and casualties were highlighted, successes and heroism downplayed or ignored. Underlying the coverage, especially of the war in Iraq, was the narrative of a Vietnam-like “unjust” war sold to Congress and the American people with manufactured intelligence, and pursued to enrich corporate cronies of the administration. Yet despite the political bias of much of its reporting of the Vietnam conflict, the media congratulated themselves for ending the war, and confirmed their status as the righteous “watchdogs” monitoring the government, “speaking truth to power,” and protecting our liberties. The Watergate affair, a political scandal of the sort that can be found throughout American history, not only confirmed the media’s self-congratulatory pose as the only thing standing between the American people and fascism, but bestowed as well the rewards of celebrity status and lucre on the reporters who in effect had simply channeled information given to them by a disgruntled FBI employee. The end result is the mainstream media today: for-profit businesses that think of themselves as morally and intellectually superior not just to other businesses, but to the organs of government and the mass of gullible voters who put politicians in office. The second development that increased the malign partisan influence of the media in the postwar period was the rise of television and the decline in the number of newspapers. With that, there were fewer and fewer information sources from which readers could chose, giving the three television networks and the big metropolitan papers, especially the New York Times, inordinate unchallenged power over public information. At the same time, those seeking alternative points of view had fewer and fewer daily papers, while the ones that remained were dependent on a few news services such as the Associated Press, which represents one point of view. To speak in Madisonian terms, one media faction had now expanded to the point that it crowded out and marginalized alternative points of view. What made the media’s bias dangerous, then, as much as their ideology was the monopoly they enjoyed. But starting in the 1980s, the rise of talk radio, cable news shows, and most importantly the Internet has created more competition for the mainstream media. Voters now have a plethora of choices for news and opinion, and the biased reporting of the past is now swiftly exposed by those alternative sources of information. There is no better example of the power of this new media world than the downfall of CBS News icon Dan Rather. In September 2004, a few months before the presidential election, Rather reported on documents critical of President Georg Bush’s Air National Guard service. Within hours Internet bloggers had exposed the documents as forgeries, and Rather’s thirty-three-year-long career on CBS soon came to an end. Media bias and partisanship are now instantly held accountable in ways that were unthinkable a few decades ago. Today, then, we are back to where we were in the past. 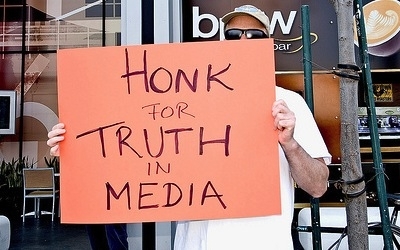 Citizens have numerous options for news and information, and numerous alternatives that challenge, balance, and correct the partisan biases of the mainstream media. More importantly, this new media world means that in a democracy ruled by the people, the responsibility for sorting out truth from partisan spin lies where it should, with the free citizens who have the civic duty to seek out and evaluate information before voting for a party or policy. Media bias is no longer an excuse for neglecting that responsibility.